Currently my exhibition Pathways is showing at Orsa kulturhus in Dalecarlia, Sweden, a great pleasure to me since Orsa is the town where I grew up. Pathways is a selection of fine art photographic prints taken in connection with my work on the project Rites of Life. One of them shows a bullfighting scene on Maestranza in Sevilla, one of Spain’s oldest bullfighting rings. I visited Spain in the spring of 2001 to document fiestas with life cycle rituals attached to the celebrations. I also spent a few days photographing the Feria of Sevilla. 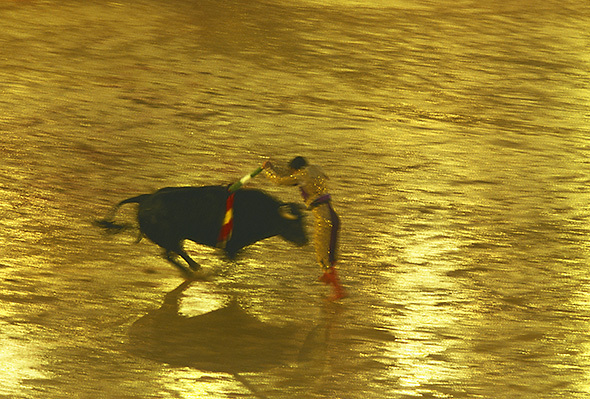 And every night there were bull fights on Maestranza. Following the advice of the owner of the hostel where I lived, I chose an evening when the big stars were performing. One of them was El Juli, famous already at the age of 15. When it was time for El Juli to sink the banderillas, the short, colorful spears, into the neck muscles of the bull, he kicked off his light, black shoes and ran out onto the arena in his pink socks in order no to slip on the sand which had turned wet from rain. Night had fallen and the bright spot lights had been turned on, and in the rain the yellow sand and El Juli’s suit of lights glittered like gold. I call the image ”Golden moment.” In order to enhance the movement it has been taken with a long shutter speed. I also shook the camera lightly during the exposure.